Today scientists at Idaho State University announced a breakthrough in the mystery of the prehistoric fish Helicoprion's spiral teeth. 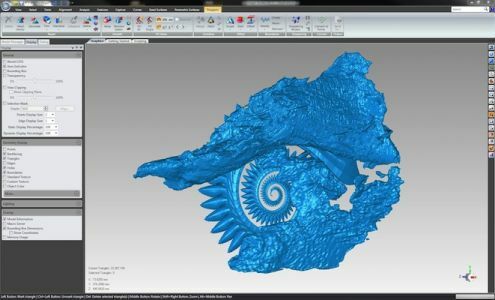 Led by Dr. Leif Tapanila, researchers used CT scans of a unique Helicoprion fossil to discover that the spiral tooth structure, which some believed to have been located on the upper jaw or dorsal fin, actually fit in the back of the lower jaw. With its teeth in this position, the creature could essentially saw the tissue of its prey by opening and closing its mouth. The placement of Helicoprion's teeth has long escaped scientists because the surrounding cartilage never survived; typically, fossils are only of the spiral teeth structure. But one fossil still had the teeth within the animal's jaws, and in 2011, scientists put this particular fossil in a CT scanner at the University of Texas, Austin. They converted the resultant scans into models and used Geomagic to fill and clean the 3D surfaces. After rendering, researchers were able to see exactly where the teeth fit. Click here to read the press release about this project. Click here to read an article from National Geographic.